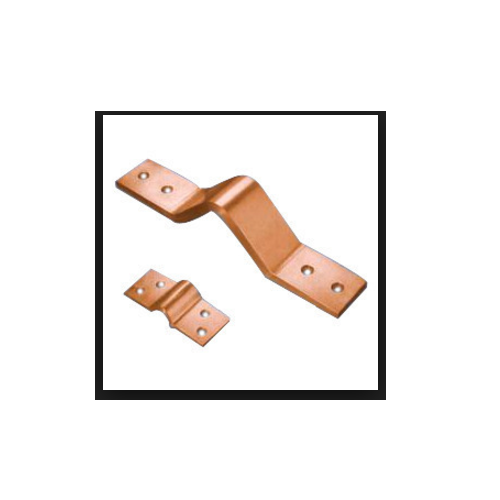 Krishna Copper involved in offering a wide range of Copper Flexible Jumper to our most valued clients. These copper jumper plates are connected, using 4/0 copper, to a central collector. The strips are bonded to the grounding cable coming into the building. We continue to use the grid for some cabinets in the room, however, for the switch and its battery plant, plus some other equipment, we now home-run 4/0 copper from each equipment cabinet to copper collector plates, which are also located under the floor. Krishna Copper Private Limited have embarked on this domain in 2008 with attaining outstanding success in manufacturing, supplying and exporting extensive array of Copper Strip, Copper Flat, Copper Foils, Copper Profiles, Copper Wire, Copper Sheet & Plate, Copper Rod other Copper Components. We have been awarded ISO 9001:2008 certification for delivering top notch quality products range from Copper Accessories, Copper Strip to Copper Plate. We always work using the latest and advance technology while following the basic principles of precision engineering. Using top class basic material along with modern tools and machinery, these are developed in close coordination with the developments taking place in this industry. Additionally, our products are rigorously examined prior getting shipped at the destination of our customers. Appreciated widely owing to their exquisite finish, high tear strength and remarkable finishing, these are highly demanded and recommended. Our infrastructure is aligned towards fulfillment of our customer needs and is spread in huge premises. Having spent so much time in this domain we procure the raw material from trusted and authentic vendors of the market which is later processed in our manufacturing unit with the help of advance and modern machines. We have a testing department that inspects and checks the quality of the products during its manufacturing on different parameters. We manufacture the products as per client specification and industrial requirements and we always try to bring in some innovative changes in our products, so as to offer the best products to our customers.